The most famous Tape-Echo Unit in Britain, and possibly in the World, the Copicat also happens to be the first repeat-echo machine manufactured as one compact unit. It was designed by Charlie Watkins in 1958, apparently after he heard a similar sound effect generated by two linked studio quality tape recorders for the Italian singer Marino Marini. Following its introduction, the tape-echo sound revolutionised pop music during the late 1950's and early 1960's, being behind the guitar sound of the top British bands including The Shadows. It also served a secondary purpose after being adopted for providing echo on vocals - the two volume controls acted as a rudimentary microphone mixer. These little machines sold by the thousand!! What is perhaps most incredible about the Copicat is that it is still in production after 50 years! Visit the WEM Copicat Website to see the latest incarnation. The very early Copicats had a rotary selector switch for the playback heads instead of the push buttons. There is a picture of Charlie holding Serial No 0001, on his website. Both this (Serial # 110) and the one that Charlie is holding in the picture have gold control panels. Perhaps a slightly later one than than the one above, as this one has a blue control panel but still the all-rotary controls. A record head, three replay heads with individual push-buttons, and a permanent magnet mounted on the tape tension arm to wipe the tape clean on every cycle. Echo signal record volume control (ECHO), plus the facility for returning the playback signal back to the record head (REPEAT), and two inputs with individual volume gain control. Oh....also a switch for turning the tape-loop motor on/off and a footswitch for killing the record head. All this powered by two ECC83's and one 6BR8 valves. Price: £38-10-00 in 1962. As well as manufacturing Copicats primarily for the UK market, Watkins also supplied Guild Guitars Inc in the USA. The "Guild" logo was prominently displayed, with "Watkins", on the machine's control panel, and an all-turquoise livery for the case was adopted instead of the usual turquoise/cream. New black and cream case covering, plus a black control panel. Otherwise, things look very similar to the turquoise/cream unit above. Very similar to the one above but with the logo on the case changed from Watkins to WEM. A new style case, with detachable lid. Still with its three valves inside ! A "budget" version of the old Copicat formula. Fitted with two playback heads. 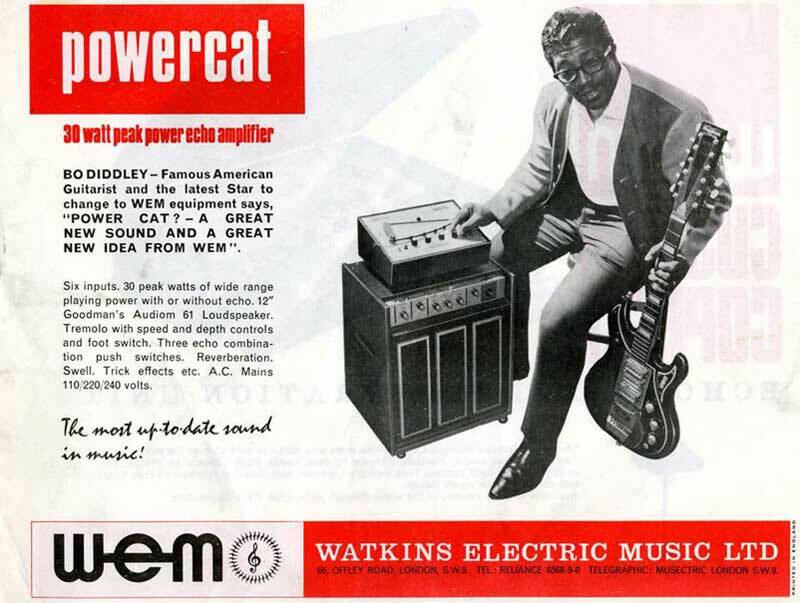 It would appear that this particular version of the Copicat formed part of a 15 watt (advertised as 30watt peak output) guitar combo/echo unit combination which was marketed by Wem as the "Powercat". An advert for this combination, featuring Bo Diddley as an endorsee, is included on the linked picture page. 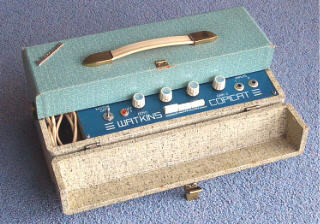 The first major change - the Copicat goes Solid-State in the late 1960's. It also now has a proper erase head instead of the permanent magnet. A Mk IV Copicat combined with a valve power amplifier unit. The first (and only) one we have ever seen !! Was this just a prototype ?? WEM COPICAT Mk IV, WITH GUILD DISTRIBUTION LOGO. As mentioned above, WEM/Watkins supplied Guild in the USA with Copicat units. This example is a standard Mark 4 but with Guild logo. Another major change from the usual formula.............. a Copicat with four replay heads! Also, a combined erase/record (Z-Combo) head was fitted. A four input channel mixer completed the transformation. This Copicat appears to be the same as the Super IC model above, with the four replay heads and combined erase/record head, but it was also equipped with "Sound-on-Sound". Originally this model was fitted with a tape cassette instead of the conventional tape loop and tension bar. The cassettes seems to have proved problematic and hence most machines were converted back to the simple tape loop. Very similar in appearance to the "Super IC" model, with a four input mixing facility, but back to three replay heads and individual erase and record heads. The storage box to the side of the control panel has now been re-located to the rear of the machine. The black-faced Copicat, still with three replay heads, but now with a variable speed tape transport with a belt drive. A combined echo/reverberation/4-way mixer unit, that as well as being a 6-head tape echo unit, also incorporated a Hammond spring-activated reverberation unit. Each of the four inputs was controlled by individual volume, bass, treble, and echo strength controls. The unit was aimed at studios, as well as large bands. A much more modern appearance, with smart blue covering for the case and a rich gold control panel. Back to a two input mixer, but with an "echo only" facility for use mixer effects. Similar to the one above, but with a "PAD" push button for each of the two inputs. This appears to provide the facilitate the reduction of gain for each input by a pre-set amount without having to use the rotary volume controls. Same as the Gold Varispeed, but with five playback heads instead of three. The side storage box disappears again, and provision is now made for the output cable and footswitch by means of panel mounted jack sockets. On this Type 2 version, a facility has been provided for "Tail-Off" and "Mellow" additional effects, utilising push/pull knobs for the Sustain and Swell rotary controls. A digital unit, but not one to be compared to all the rest of the digital delay units. Any problems with your Selmer or Watkins/WEM Echo Unit? Don't mess about......go to the best! John Beer of Amp-Fix, Wellington, Somerset has considerable experience with these types of machines, as well as all types of valve amps. Click HERE to make contact with John. Also, visit John's AMP-FIX WEBSITE where you will find very detailed descriptions of many of the Copicats listed above. Many thanks to John Beer for the advert scan above.